In vitro fertilisation (IVF) is regarded as one of the great medical advances of the late twentieth century, enabling many involuntarily childless couples to have babies. The development of the treatment had many scientific and ethical issues to resolve before the first baby, Louise Joy Brown was born on 25 July 1978. "Your pioneering work therefore represents a monumental achievement that truly can be said to confer the greatest benefit to mankind. The result of your work has touched us all, giving millions of infertile couples a precious gift, a child." Robert Edwards, a reproductive biologist, began his work on human reproductive biology in the early 1960s. Seeing the potential for treating infertility, he decided to try to develop a method for fertilising human eggs outside the body and then return them to the woman. He clarified the maturation process of human eggs outside the body and the effects that various hormones have on the process. By 1968 he was achieving the fertilisation of eggs in the laboratory and started a collaboration with gynaecologist surgeon Patrick Steptoe who used laparoscopy to remove eggs from ovaries. Their first successful human test-tube fertilisation took place in 1970 but Edwards and Steptoe continued to encounter scepticism and resistance until the breakthrough in 1978 which produced the first ever IVF birth. The project and technique raised ethical concerns about the beginnings of life and the natural limitations of humans. Receiving many honours for his pioneering work, he received the Nobel Prize for Medicine in 2010, by which time over four million children had been born as a result of IVF. 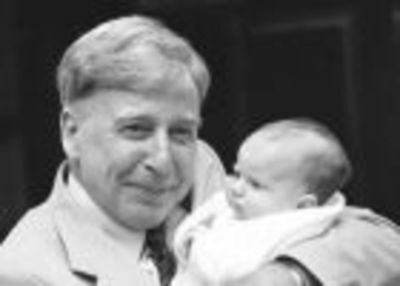 Robert Geoffrey Edwards is a Nobel Prizewinning biologist and pioneer of invitro-fertilisation. He was a Research Fellow in the University's Department of Biochemistry in 1962-3 and published a number of research papers with this affiliation. Edwards began work on fertilisation in 1955, and forged his research partnership with gynaecologist surgeon Dr Patrick Steptoe in 1968. Although the first successful human test-tube fertilisation took place by 1970, research did not result in a successful pregnancy for another eight years. By the late 1970s, funding for Steptoe and Edwards' project was running out, and their work met with scepticism, resistance and set-backs. But in 1978, a breakthrough resulted in a healthy pregnancy and the birth of the first ever 'test tube baby', Louise Brown. Edwards and Steptoe went on to establish the first IVF clinic at Bourn Hall, Cambridge, in 1980. Before Dr Steptoe died in 1988, Edwards, now a Professor of Human Reproduction at Cambridge, was able to tell his seriously ill colleague that one thousand babies had been conceived at the clinic. Professor Edwards has a living legacy to his work with over four million children born as a result of IVF. Receiving many honours for his pioneering work, he received the Nobel Prize for Medicine in 2010. At the announcement of the award it was stated that "His achievements have made it possible to treat infertility, a medical condition afflicting a large proportion of humanity including more than 10% of all couples worldwide." Edwards, R. G. 1980. Conception in the human female. London: Academic Press. World Changing Project, "Developing in vitro fertilisation," in University of Glasgow World Changing (University of Glasgow, 2010); http://www.worldchanging.glasgow.ac.uk/article/?id=113 (accessed April 19, 2019). World Changing Project. "Developing in vitro fertilisation." In University of Glasgow World Changing. University of Glasgow, 2010. http://www.worldchanging.glasgow.ac.uk/article/?id=113 (accessed April 19, 2019). World Changing Project. "Developing in vitro fertilisation." University of Glasgow World Changing. University of Glasgow, 2010. 19 April 2019 <http://www.worldchanging.glasgow.ac.uk/article/?id=113>.